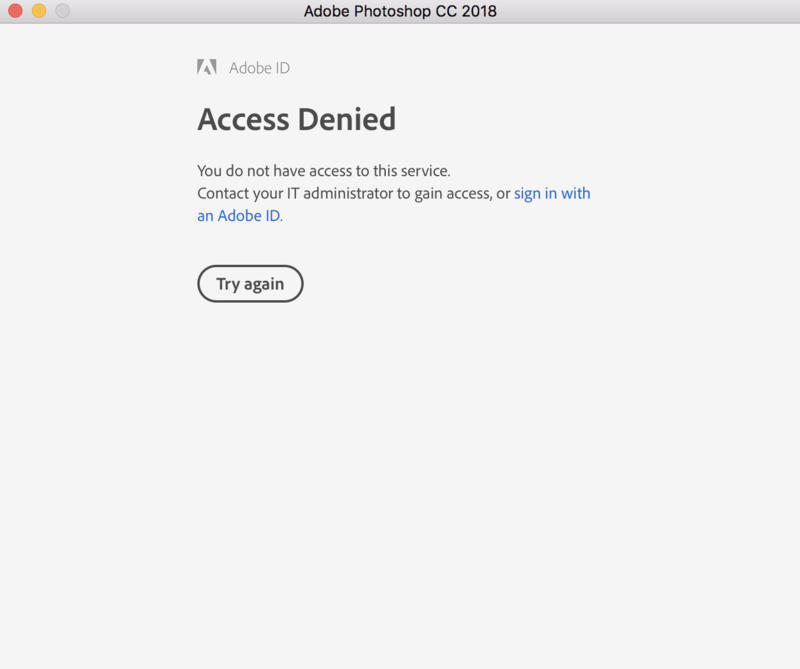 In order to provide the best possible software solutions for our students and staff, DTS is working with Adobe to improve how users acquire, and access Adobe products. 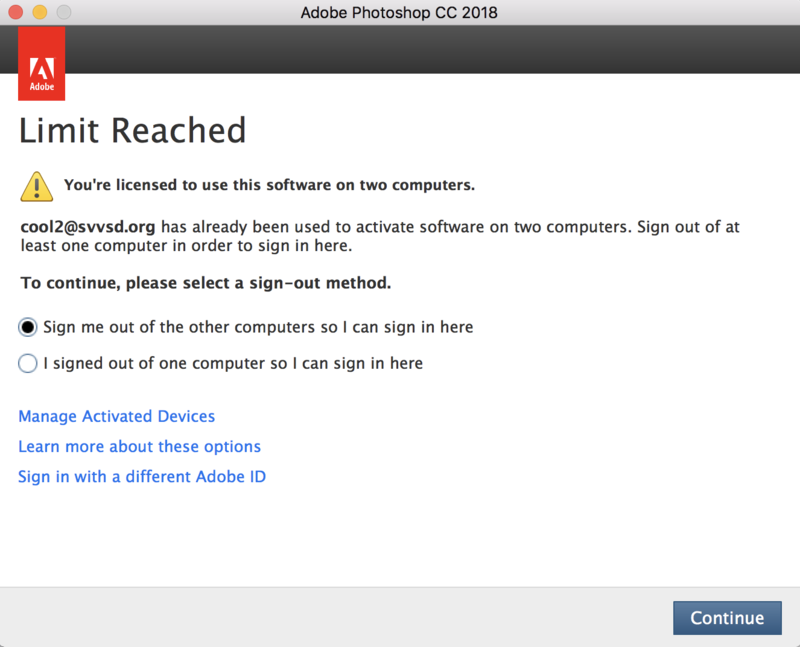 Sometime during the Fall 2018 semester, Adobe software licensing will transition from a computer-based model to a user-based model. DTS will handle any necessary changes to your system while we make the transition. 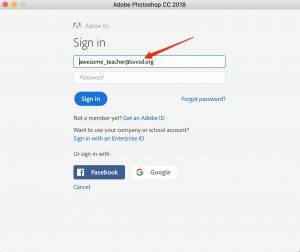 Some examples of Adobe products are Photoshop, Lightroom, and Acrobat Pro (DC). Please note that Acrobat reader is a FREE program that is not impacted by any licensing. Click here for a full list of the Adobe Creative Cloud software. With this new model there are now two parts needed to use the various Adobe Products: acquiring the software, and activating the software. 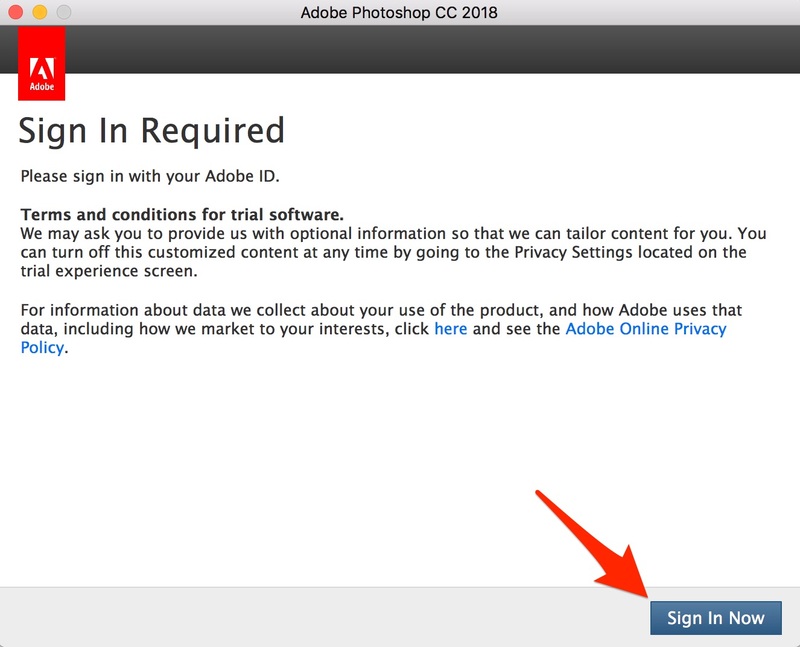 If the Adobe products are already installed then they can remain installed on the computer. To get new installations of the Adobe products, anyone can use Self Service (Mac only), or use LANrev On Demand for Windows computers. To request installation for entire labs or computer carts, please fill out a work order request. 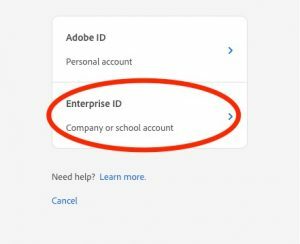 Note: Even if the software is downloaded, each user will require an activated Adobe account in order to use the software. In order to maximize access to the Adobe suite and minimize licensing costs, DTS has identified the most likely users (both student and staff) of the Adobe software. 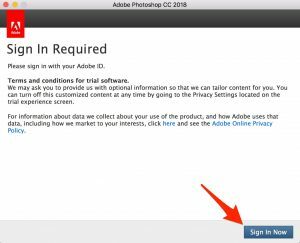 Most users will simply need to launch any Adobe program, such as Photoshop, and log in when prompted. This will activate the software for a given user account on a computer. Please note: This will have to be done for each computer used for a given user account. Below are the steps needed to log in and activate the software. Open any Adobe Creative Cloud application. 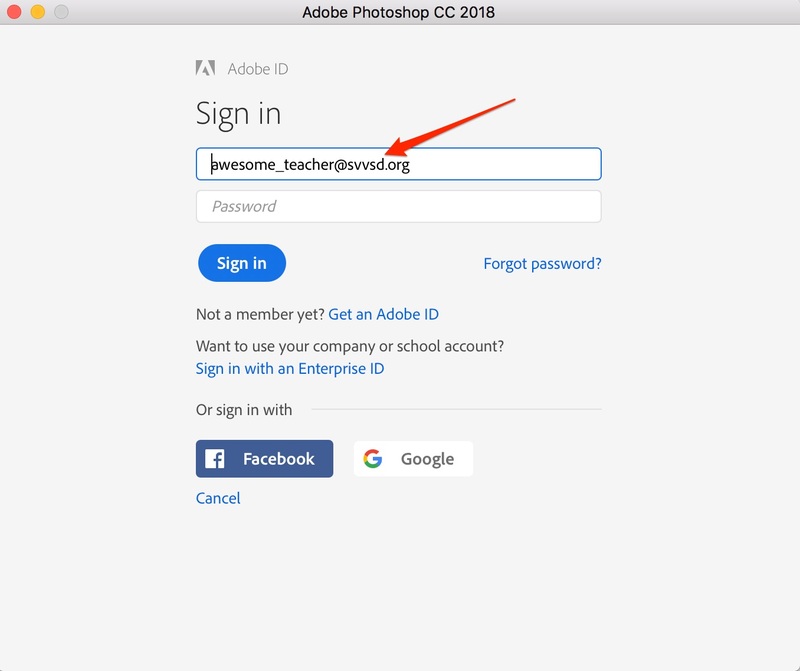 This will open the Adobe Sign on Page. Enter your full district email address and press the return key on your keyboard. This will bring up our district sign on. 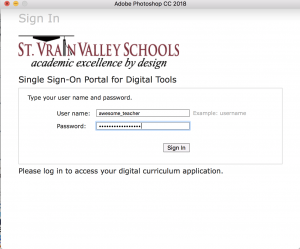 Enter your district username and password without the @svvsd.org. Follow this link to a form for access request. Wait 48-72 hours for the request to process. 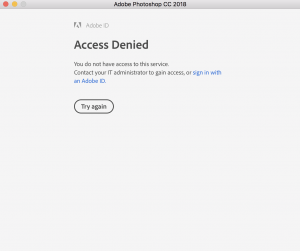 If an “Access Denied” error is displayed, then the user account needs to be activated for access to the Adobe software. 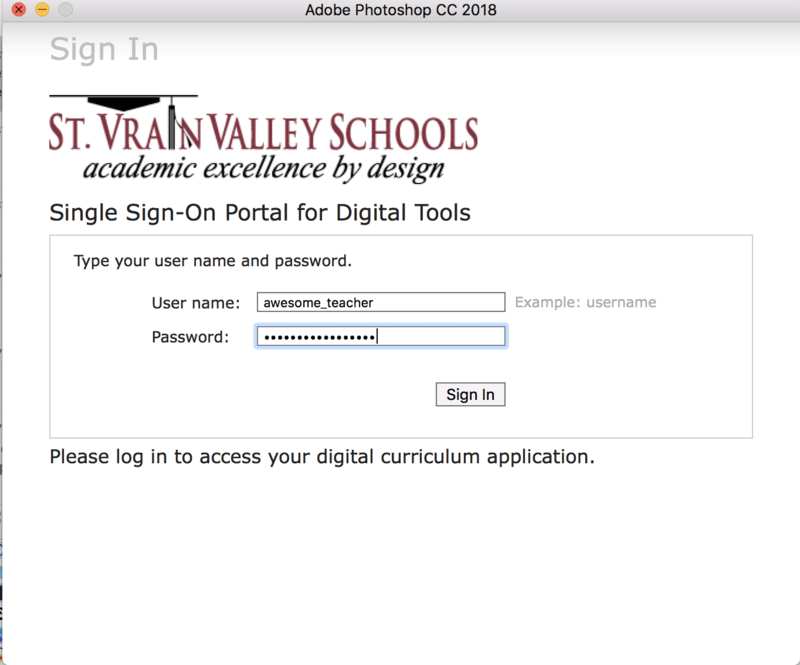 Follow the instructions below to gain access to the Adobe suite. PLEASE NOTE THAT IT CAN TAKE 48-72 HOURS FOR ACCESS TO BE PROCESSED. 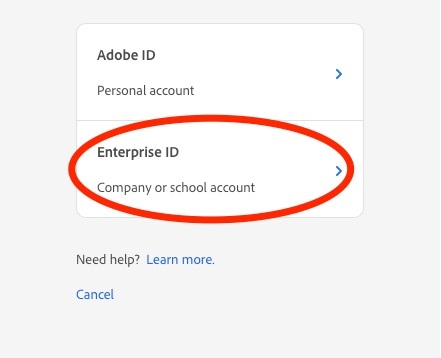 When signing in, if a choice is presented to log into either an Adobe ID account or an Enterprise ID account, please select the Enterprise ID option.